What Are the Eye Problems Caused by Ankylosing Spondylitis? How Are AS-Related Eye Problems Treated and Diagnosed? Ankylosing spondylitis (AS) is a type of progressive arthritis that leads to chronic inflammation of the spine and the area where the spine joins the pelvis (sacroiliac joints). Ankylosing spondylitis primarily affects the axial skeleton (skeleton of the head and trunk) and the related ligaments and joints. Ankylosing spondylitis can also affect other joints and organs in the body, including the eyes, lungs, kidneys, shoulders, knees, hips, heart, and ankles. The term ankylosing spondylitis refers to stiffening and inflammation of the spine. Ankylosing spondylitis causes stiffness, aching, and pain around the spine and pelvis. The spine stiffens because of inflammation of the joints between the bones of the spine. This inflammation can cause the vertebrae to fuse together and eventually can lead to a total fusion of the spine. This fusion occurs when the vertebrae (spinal bones) actually grow together, fusing the spine due to calcification of the ligaments and disks between the individual vertebrae. If the vertebrae fuse together, the spine loses its mobility, leaving the vertebrae brittle and vulnerable to fractures. Ankylosing spondylitis may also cause a curvature of the spine. Ankylosing spondylitis is often referred to as a form of inflammation of the bony spine called seronegative spondyloarthropathy. In the case of ankylosing spondylitis, the term seronegative means that blood tests do not show the presence of certain factors seen with rheumatoid arthritis. 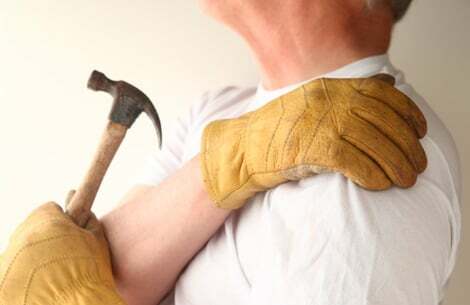 The term spondyloarthropathy means a disease that affects the joints of the spine. Ankylosing spondylitis primarily affects young adults and is more common in males than in females. This disease is also more common in Caucasians than in African Americans. The onset of ankylosing spondylitis is most common in men 17-35 years of age. In women, the symptoms of ankylosing spondylitis often first appear during pregnancy. A specific gene for the HLA-B27 tissue type is present in many people who have ankylosing spondylitis. Of people with ankylosing spondylitis, most also have the gene for HLA-B27. This does not mean, however, that a person will automatically get ankylosing spondylitis if he or she has the gene. Although a small percentage of Americans have the gene for HLA-B27, less than 1% of the population actually has or will develop ankylosing spondylitis. However, if a person is thought to have ankylosing spondylitis, a blood test is useful to determine if that person has the gene for HLA-B27. In the early stages of ankylosing spondylitis, determining a definite diagnosis is sometimes difficult. If a person has the specific signs and symptoms of ankylosing spondylitis and he or she has the gene for HLA-B27, the diagnosis of ankylosing spondylitis is likely correct. The diagnosis of ankylosing spondylitis is made on the basis of a history, a physical exam, X-ray films, and laboratory tests. A cure for ankylosing spondylitis does not currently exist; however, effective treatment options can relieve pain and improve a person's condition. The general approach to treatment includes medication, physical therapy, and exercise. Surgery may be necessary to treat problems caused by ankylosing spondylitis in the spine and other joints of the body. About 30% of people with ankylosing spondylitis develop anterior uveitis sometime in the course of their disease. 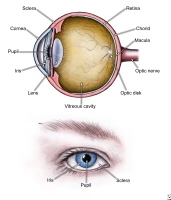 Anterior uveitis is an inflammation of the front part of the eye called the uvea, including the iris and ciliary body. The cause of anterior uveitis is unknown; however, the immune response associated with ankylosing spondylitis that causes the spinal problems is most likely similar to the inflammation seen with anterior uveitis. Many other possible causes of anterior uveitis exist, but when ankylosing spondylitis is present, the development of anterior uveitis is most likely related to ankylosing spondylitis. The symptoms of anterior uveitis may include eye redness, light sensitivity (photophobia), tearing, eye pain, and blurred vision. Discharge from the eyes is uncommon. The eye pain associated with anterior uveitis is described as being deep and is made worse by bright light. Eye symptoms usually develop over a few hours. Anterior uveitis associated with ankylosing spondylitis may occur in one eye or both eyes and tends to be recurrent. Diagrams of the eye. Click to view larger image. An ophthalmologist (a medical doctor who specializes in eye care and surgery) examining a person with anterior uveitis will obtain a medical history that includes specific questions about the presence of low back pain. In fact, an ophthalmologist may be the first doctor to make the diagnosis of ankylosing spondylitis. An ophthalmologist also performs a complete eye exam on a person with anterior uveitis. The exam includes a visual acuity test, a pupil examination, a slit-lamp examination, an intraocular pressure measurement, and a careful inspection of the back of the eye after dilating the pupils. In certain cases, oral nonsteroidal anti-inflammatory drugs such as ibuprofen and oral corticosteroids such as prednisone may be used. See the article Understanding Ankylosing Spondylitis Medications for more information. Occasionally, the severity of inflammation may require treatment with corticosteroid injections around the eye. If the intraocular pressure (pressure within the eye) is elevated, additional eyedrops may be required to decrease the pressure. The person's primary-care doctor may recommend other oral immunosuppressive drugs to be taken in conjunction with the eye drops prescribed by the ophthalmologist. In recalcitrant cases, injections of immunomodulating drugs such as infliximab, etanercept or adalimumab may be considered. Complications of repeated episodes of anterior uveitis caused by ankylosing spondylitis may include adhesions of the iris to the lens (meaning that the iris sticks to the lens), cataract formation, glaucoma, and macular edema. Macular edema is a swelling of the center of the retina and can cause decreased vision. To minimize the occurrence of these complications, the ophthalmologist closely observes the person and promptly treats any episodes of anterior uveitis. Some people who have recurrent anterior uveitis may require continual treatment with eyedrops to prevent these recurrences. People with ankylosing spondylitis must understand that any eye redness or eye pain requires prompt attention by their ophthalmologist. The ophthalmologist usually consults with the person's primary-care doctor, the rheumatologist (a medical doctor who specializes in diseases of the joints, muscles, and bones), or both, and together, they will use a team approach to manage the care of the person with ankylosing spondylitis and anterior uveitis. Ankylosing spondylitis is a chronic condition that requires a person to be aware of and understand the disease process as well as to be an active participant in the treatment process. Careful attention to this condition results most often in successful control and preservation of function. What symptoms of ankylosing spondylitis-related uveitis did you experience? What treatment did you receive for ankylosing spondylitis-related uveitis?